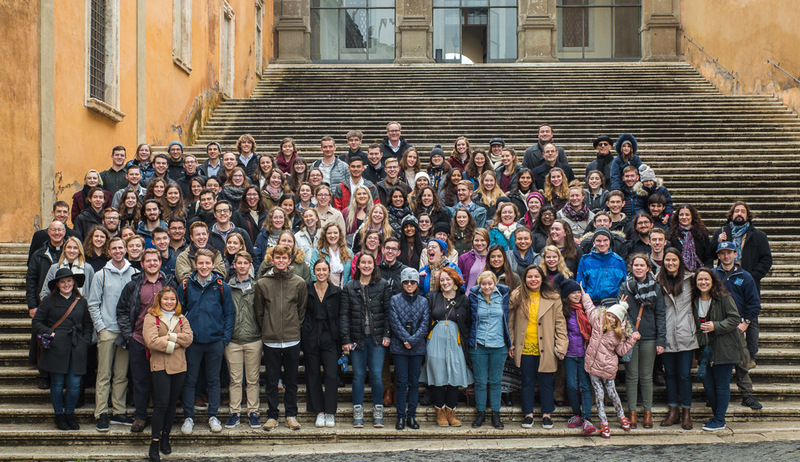 UD Rome students are fortunate to live and study on a beautiful campus that was once a working Italian villa. The property still has its own working vineyard and produces its own organic wine, now with a beautiful new wine label! The vineyard is approximately five acres, planted with 85% Merlot grapes and 15% Cabernet Sauvignon grapes. This year, the Fall 2016 class had the opportunity to harvest and stomp grapes from the vineyard, playing an important role in the famous Vendemmia, or grape harvest, which will yield new UD wine! The day after the Vendemmia, continuing their ever-busy semester, the students had their third Art and Architecture visit. 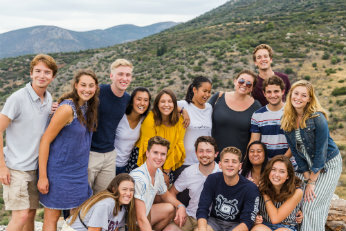 This time, Dr. Robinson took the class to a peaceful and green area outside of the center of Rome to study two early churches: Santa Costanza and Sant’Agnese Fuori le Mura. Both churches showcase the movement from pagan art to Christian art, and this was the main focus of Dr. Robinson’s lecture. In Santa Costanza, originally built as a mausoleum for Constantina and converted into a church in the 13th century, the students looked closely at the 5th century mosaics as examples of Christian artwork, something quite new at the time of their creation. In Sant’Agnese, a beautiful basilica dating back to the 7th century, Dr. Robinson discussed the growth of the early Christian church in Rome, again pointing out the novelty of the Christian artwork in this basilica. As the basilica is built over St. Agnes’ tomb, Dr. Robinson also talked about the differences between pagan and Christian burials and how the transition was made.